>3M Polyester Film Tape #850 Silver - 1/2 in. x 72 yds. 3M Polyester Film Tape #850 Silver - 1/2 in. x 72 yds. 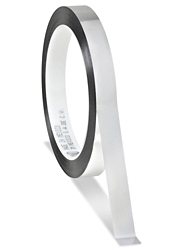 3M Polyester Film Tape 850 is generally used for splicing and web applications. The backing is a thin, high-strength polyester which is abrasion resistant to help reduce splice failures while resisting breakdowns during rough handling and web processing. Coated with an aggressive pressure sensitive acrylic adhesive, this tape grabs on contact and holds securely. It meets low-caliper requirements to ensure it won't interfere with most machinery. The tape can withstand a wide temperature range from -60°F/-50°C to 300°F/150°C. 3M Polyester Film Tape #850 Silver 3/8 in. x 72 yds.